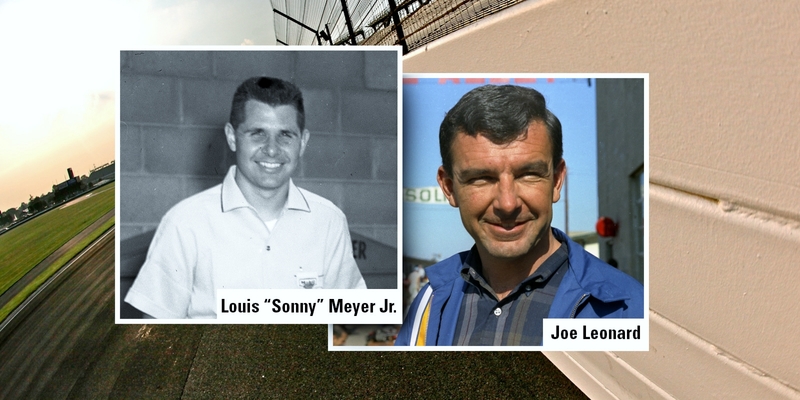 The 1968 Indianapolis 500 pole winner Joe Leonard and legendary chief mechanic and engineer Louis “Sonny” Meyer Jr., are the 2013 inductees to the Auto Racing Hall of Fame at the Indianapolis Motor Speedway. Leonard and Meyer will be inducted in two ceremonies during Race Week of the 97th Indianapolis 500 in May. A public Hall of Fame Induction Ceremony is scheduled for 10-11 a.m. Friday, May 24 on the Pagoda Plaza Stage during Coors Light Carb Day. The invitation-only 29th Annual Oldtimers Recognition Dinner and Auto Racing Hall of Fame Induction Ceremony will take place at 7 p.m. Thursday, May 23 at the Indianapolis Marriott Downtown. Leonard competed in the Indianapolis 500 nine times from 1965-73 and won two USAC National Championships after making a successful transition in the early 1960s from motorcycle racing to auto racing. He captured American Motorcycle Association national championships in 1954, 1956 and 1957. His auto racing career started as a driver for famed IndyCar and Stock Car builder; Ray Nichels. Leonard joined Nichels Engineering in 1964 and drove his way to Rookie-of-the Year honors in the ultra-competitive USAC Stock Car Division. The versatile Leonard won the pole for the 1968 Indianapolis 500 with track records of 171.953 mph for one lap and 171.559 for four laps driving one of Andy Granatelli’s turbine-powered four-wheel-drive Lotus “wedge” cars and was leading the race when forced out with nine laps to go. He placed third in the “500” in 1967 and again in 1972. Leonard captured the National Championship over his high-profile Vel’s Parnelli Jones teammates, Al Unser and Mario Andretti, in 1971 and 1972. He also won the 1971 Ontario 500 and the 1972 Pocono 500, plus three USAC races at The Milwaukee Mile and one at Michigan International Speedway. Meyer, son of three-time Indianapolis 500 winner Louis Meyer, was a wizard of racing engine preparation. It is estimated that he was directly involved with preparing the winning Indianapolis 500 engine 15 times, most notably in 1973 with Patrick Racing, driver Gordon Johncock and crew chief George Bignotti. Meyer also led engine development with Vince Granatelli Racing and was the development engineer of the potent V6 turbocharged Buick engines fielded for many years by John Menard’s team. Meyer joined Meyer & Drake Engineering shortly after his father and Dale Drake purchased the Offenhauser engine business from Fred Offenhauser in early 1946. In addition to his engineering duties, Sonny Meyer also served as a “500” crew member, becoming a chief mechanic for the first time in 1958 when veteran Tony Bettenhausen finished fourth after leading the very first Indianapolis laps of his storied career. When Louis Meyer sold out to Dale Drake in 1964 to become the distributor for Ford’s double-overhead camshaft V8 racing engine, Sonny Meyer relocated to Indianapolis, where he mentored many future chief mechanics who trained under his leadership during the next five years. The Auto Racing Hall of Fame, established in 1952, is located at the Indianapolis Motor Speedway Hall of Fame Museum. The greatest names in Indianapolis 500 history – drivers, team owners, crew chiefs, designers, officials and more – earn racing immortality through induction into the Hall. 2013 Indianapolis 500 tickets: Tickets are on sale for the 97th Indianapolis 500 Mile Race on Sunday, May 26 at IMS. Race Day ticket prices start at just $30. Fans can buy tickets online at www.ims.com/tickets by calling the IMS ticket office at (317) 492-6700, or (800) 822-INDY outside the Indianapolis area, or by visiting the ticket office at the IMS Administration Building at the corner of Georgetown Road and 16th Street between 8 a.m.-5 p.m. (ET) Monday-Friday. Children 12 and under will be receive free general admission to any IMS event in 2013 when accompanied by an adult general admission ticket holder.